February 29, 2012  In the first hour of Talk of the Nation, the political junkie recaps the week in politics, and author Sandra Tsing Loh talks about caring for her aging father. In the second hour, the U.S. and Afghanistan, and the link between politics and gas prices. 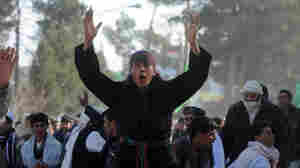 Will Killings Over Quran Burnings Lead To Faster Pullout From Afghanistan? 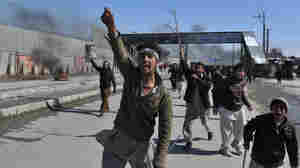 February 27, 2012  The plan has been for U.S. and NATO military personnel to be be in Afghanistan at least another two years to advise the Afghan military. Attacks and protests, though, are making it increasingly difficult to perform that mission. February 25, 2012  The attack comes during a week of violent unrest in Afghanistan following the reportedly accidental burnings of copies of the Quran at a U.S. military base earlier this week. 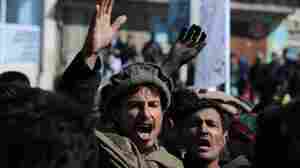 February 23, 2012  There have been protests in various parts of Afghanistan since word broke that some Islamic religious materials, including Qurans, were inadvertently burned by international military personnel at the Bagram Air Field north of Kabul. Report: Two U.S. 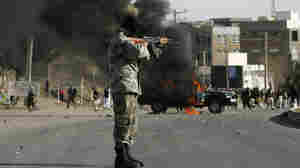 Troops Killed In Afghanistan; Quran Burnings Backlash? 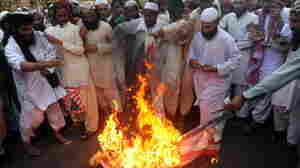 February 23, 2012  There has been anger over the burning of some Islamic materials, including Qurans, at an air base used by international forces. The commander of those forces has apologized, but protests continue. 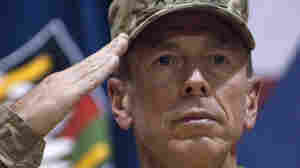 February 22, 2012  The commander of NATO forces in Afghanistan has apologized. But the anger remains. 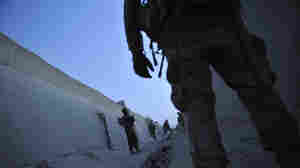 January 20, 2012  Four French troops were killed today by a member of the Afghan National Army. The New York Times says there have been dozens of such attacks since 2007. Also today, six U.S. Marines died in a helicopter crash. The cause of the crash isn't known. December 23, 2011  The mention of picnics brings back memories of a 2003 visit to that Afghan village — and the hopeful signs there that life could indeed be "normal" again in that war-torn country. December 22, 2011  In late November, American airstrikes killed 24 Pakistani soldiers. The incident added to already frayed relations between the nations. The Pentagon says U.S. forces "acted in self defense," but that there was "inadequate coordination" with Pakistan.